With SQL Server 2016 and SQL Server 2017, database programmers can query JSON data in their SQL codes using build-in OpenJSON SQL table valued function. In this Transact-SQL tutorial, I'ld like to share basic examples for OPENJSON SQL queries in combination with OPENJSON TVF using WITH clause where output json column values can be defined. In fact, with increasing usage of JSON especially in web applications or in mobile apps, each passing day database developers require methods to query JSON data using SQL more and more. 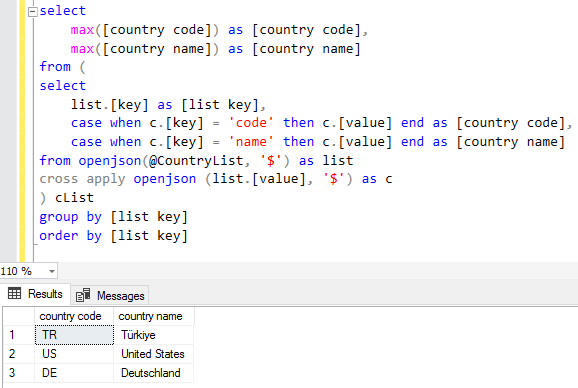 I hope this OpenJson tutorial with given samples enables SQL Server database programmers a fast start with querying JSON strings. Let's start with a simple query. 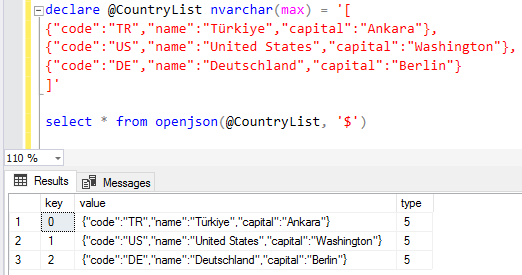 Assume that you have a JSON string which includes basic information about a single country including its code, name and capital city name. 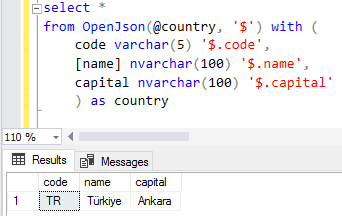 For example, following JSON string is storing country details for Turkey. As seen above, the key-value pairs are listed following each other with one-to-one relation. Now as a SQL developer, I want to convert above JSON string into a tabular format with code, name and capital are the column names of the query output. As in below screenshot showing the output result of the OpenJSON table-valued function, database programmers managed to fetch each key and its corresponding value as a list. Actually, I am not interested in TYPE column but more on key and value column values. But I think it will be more understandable at least for my data model if I could see all these distinct properties of the country in a single row. As seen in the query output, now instead of displaying each JSON property in a seperate line, using the WITH clause settings each JSON property is converted into a column data. 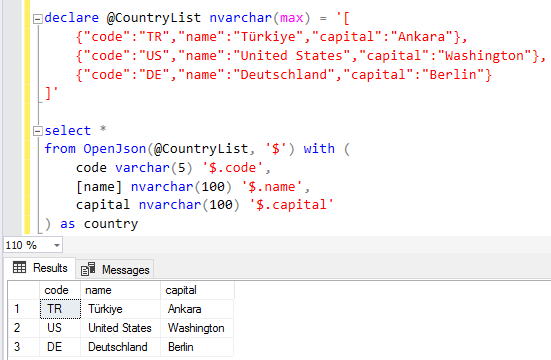 In OpenJSON WITH clause the column names are defined with their SQL data type definitions. Additionally, we have mapped the JSON query value for that recently defined SQL column data. See below output? There is no need to modify our SQL query if our JSON string includes data for more than single object. Another solution I want to introduce you is actually a little bir more longer and unnecessary especially after you understand how above SQL solution works. As seen below, in the query output we have each JSON object in a seperate row in JSON format. So we have simply splitted JSON string into objects it included so that each object is represented again in JSON format. At this point, SQL database developer can use CROSS APPLY in combination with OpenJSON to split each single JSON object into its key-value pairs as follows. This output rows can be pivotted into a more meaningful result set using CASE statements for each desired output column and a key column identifying each single country in combination with a GROUP BY clause. Please check following SQL SELECT query where row data is converted into column data for each country property based on that related country.